Getting to NF-535, otherwise generically labeled Oak Creek, was a brief and picturesque hop. That places me something like 7 miles south of the Expo site and not much further to Flagstaff itself. Along the way, I checked out Nationwide Pack & Ship in Sedona as a possible mail forwarding service. I’ve been seriously considering moving my domicile to Arizona for a number of reasons, and have been researching the few mail forwarding businesses that offer a residency mailing address for such things as drivers license and registration, banking and so on. My one stipulation is that it be outside of the emissions testing requirements around the Phoenix and Tucson areas. That’s because Arizona’s test bureaucracy is onerous, requiring emissions testing and mailed forms and fees when tests are due, even when the vehicle is out of state. That’s not workable. The most conveniently located forwarding service is in Quartzsite, but a visit there revealed that the owner is actively trying to get out of the business, which means that address will eventually evaporate and I’d have to find another. Most forwarders outside those two cities who advertise themselves as such are little more than shippers with postal mailboxes, which doesn’t do much good. Those can’t be used as residential addresses for legal state purposes. At any rate, Nationwide has the goods, and looks to have some permanency, but lacks any online Internet notification or control like most dedicated mail forwarders. You have to call for find out what’s in, or have them send it to you. I can live with that. There’s a potential forwarder yet to check out in Yuma, though. No rush. I have yet to make any decisions one way or the other. Arizona is not a popular state for RVers to establish domicile, but that tends to apply more if one has major income streams to protect. Fortunately, I have no such burdens to carry and have a freer choice. Sedona itself is an odd little town along state route 89A. Because of its location in the midst of some pretty spectacular scenery, combined with physical limitations on what roadways can be like and where they can go, it’s both inordinately popular and unable to accommodate that. This turns it into a happinin’ place with an expensive, artsy tourist-town vibe, stuffed to the gills with people and cars. Even jamming the Intrepid into Nationwide’s parking lot at the west end of town took up half the lot and plugged one of its two entrances. I should have thought to mount a camera beforehand, but didn’t. Once through town, 89A winds its way between some pretty imposing cliffs, though the views of them are most often blocked by tall trees. The roadway itself has been widened past the original pavement that no doubt once resembled the claustrophobic width of the unmolested sections of historic Route 66. Still, the pavement ends at the white lines, and a constant border of trees, rocks, guard rails and cliffs gives no quarter beyond them. At all. It pays to stay awake and limit gawking at what’s towering above you. I eventually did throw my iPhone into its windshield mount to capture some footage, but the scenery was a bit less intense and the pavement more civilized. I’ll see if I can do anything with it, and if so, post the drive separately. Just after a series of switchbacks to gain elevation, there was a highly organized “Scenic Viewpoint” with a very large parking lot. A horde of tourists milled about, none of which were speaking to each other in English. Eastern European is what most sounded like, and it reminded me just how much more travel-minded Europeans are than us, They don’t mess around. This Scenic Viewpoint has a string of Native American artisans hawking their wares. They did a fairly brisk business in handmade jewelry. Good quality stuff. A view from one of several viewpoints. NF-535 is a mile north of the viewpoint, and on weekends, has some traffic. It’s fairly smooth, enabling me to rocket up its climb, at times exceeding 15 MPH. There’s no gravel though, so wet weather might pose some issues. Dry, just about anything can make it in. It’s 1-1/2 lanes though, so a wide motorhome might have some challenges with approaching cars. I can’t really recommend a forty-footer in here. 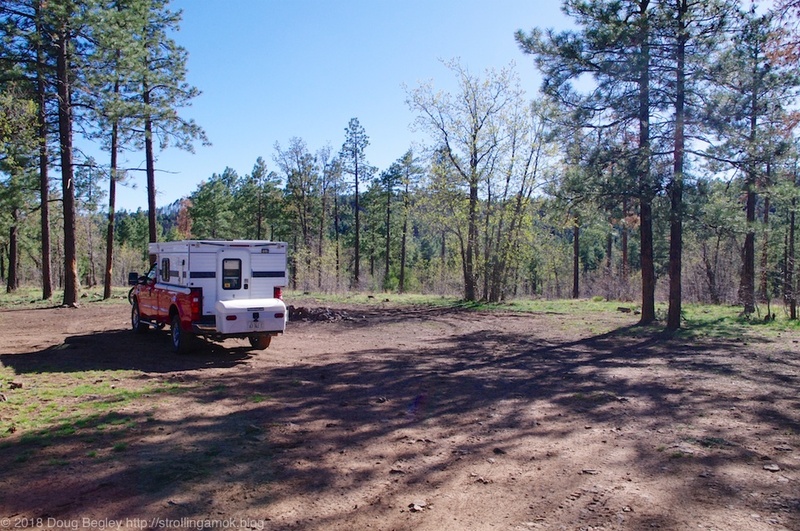 There are quite a few campsites near the entrance, and those are nestled under a dense cover of pines. Those are appropriate if you’re not dependent on solar. Basically, the larger the rig, the fewer options exist for site selection. Further in and higher up, the trees have been thinned out, allowing me to choose an appropriately lonely spot before even getting to the top. Though not the most scenic site I’ve ever picked, it’s flat, fully workable for solar, and has easy access to 89A without any drama. It also has 3 of 4 bars of cellular signal, per my phone. I can tell it’s a mudpit when wet, but no precipitation is forecast. It should be just fine for my purposes. What’s more, when I involuntarily woke up just before sunrise and went outside to take a picture, a large bull elk trotted past a couple of hundred yards away in the dim light. Awesome. Nope, my telephoto is in the truck cab, my tripod is in the cargo box, and my camera stinks in dim light. If you want to see a full-scale elk in its native habitat, you’ll have to camp here. I had considered stopping by Pumphouse Wash, a very large designated-spaces type campground on the way here, but online photos showed it to have those spaces packed way too close to each other. Eeeeww. That’s for weekend partygoers from Flagstaff. The only thing about NF-535 to keep in mind is that it’s best to refer to an MVUM when finding a place to camp here. Near the top of the climb is a water tank which is a no-camping area, and I’m just short of that. There are apparently much more scenic places to camp further on, but I’m content here and would only move if it seemed necessary. Doesn’t look like it will be. This will do nicely. I am 22 years with the Escapees as my domicile and mail forwarding. Never a moments trouble in that time. Texas, Florida or South Dakota, Barney? Texas. Received mail from them all over western USA and Alabama during my time since I started the service. I also have Escapees mail, but I’ve also lived in Texas, so it was just an address change.